Security giant Avast Software published version 18.8 of its consumer-oriented security products for Windows recently. 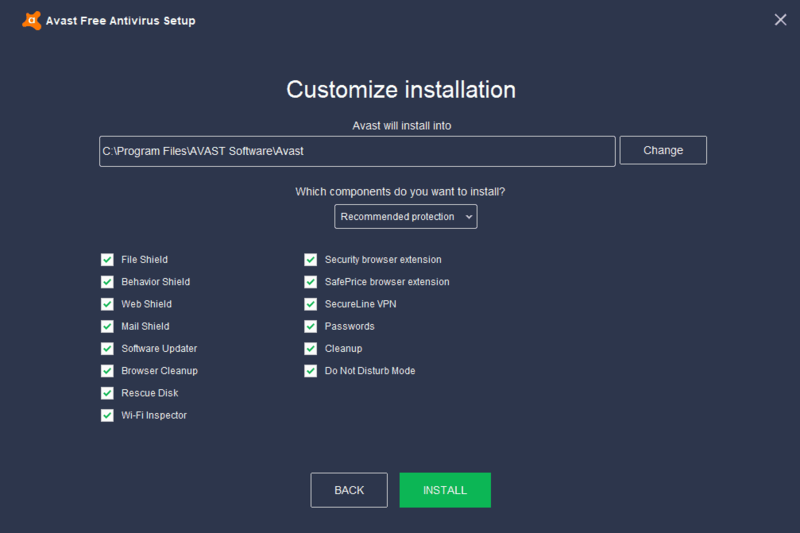 The company, which acquired AVG back in 2016 and Piriform, maker of CCleaner in 2017, released Avast Free Antivirus 18.8 and the commercial products Avast Internet Security and Avast Premier. The new releases fix a critical security vulnerability in the products. Avast notes that version 18.8 is the last version that it plans to release for Windows XP or Windows Vista. Microsoft ended support for Windows XP in 2014 and support for Windows Vista in 2017 officially. Companies like Google or Mozilla ended support for their products on these operating systems at a later point in time due to the large number of systems still in use. Mozilla, for example, ended support for Windows XP and Vista in June 2018 officially while Google dropped support for XP and Vista in 2016. Coincidentally, that meant that Google ended support before Microsoft did in the case of Vista. Avast planned to end support for Windows Vista and Windows XP with the release of version 18.7 but it appears that the company had a change of heart. It is likely that the security issue that was patched in version 18.8 had something to do with the decision but the company did not explain why it made the decision to release this new version for XP and Vista as well. Avast customers who run a consumer software product on XP or Vista machines will notice that the installed product won't receive any more version upgrades. The company plans to release version 19.1 in December 2018 and that version won't be distributed to systems running Windows XP or Vista. Virus definition updates, however, will still be distributed to systems running the unsupported operating systems. Essentially, what this means is that Avast installations on XP or Vista won't receive any more feature updates. Systems will still be protected thanks to the virus definition updates that are still pushed to these devices. End of support affects AVG consumer products for XP and Vista in similar fashion. Avast 18.8 will be installed on XP or Vista systems even if the latest Avast installer is being used and even if it will install a newer version on devices running Windows 7 or newer versions of Windows. Now You: Which security products do you run on your systems? Nice, changed over the Years from Antivir to Avast and then to Panda Online Security. Due to Issues with Panda,…(Website kicked off Panda), i changed back to Avast. I made my Explorer crash to see if Avast reloads itself, it did it, Panda didn’t. There to say is, if installing Avast, i recommend to use personal install, to prevent ALL Functions to be allowed. Then configure itself for your personal Requests and set Places offline, which you no want to be scanned. Als fine here on Windows 10 1809, first Edition, 2 GB RAM, Dualcore Intel Processors, Geforce 9400 GT Graficscard. Set Virtual RAM on 2 Harddisks, both on 5 GB, no Problems so far, Games going, Videos (MP4/Divx) run like Charm. Video Player in Use is MPC-BE Version 1.5.2. Double Monitors used on 75Hz. I opened Sysinternals “Process Explorer” to see the 2 Panda services “PSUAService.exe” and “PSANHost.exe”, and the console executable “PSUAMain.exe”. I re-started Windows Explorer and these 3 things remained running throughout and afterwards, but the Panda Notification Area icon is no longer visible. Then I opened the console “PSUAMain.exe” (the thing that the notification icon relates to) and again re-started Explorer and the console remained open and functional (I could check for updates) afterwards. I would not discard Panda as a viable AV just because of the icon. If you are looking for an Avast alternative, then maybe try installing Panda AV and Process Explorer and check if it continues running on your PC. And further to my previous comment above, my daily Panda AV “critical areas” scheduled scan has just completed successfully at the turn of the hour just gone after the 2 Windows Explorer re-starts (and without any PC restart). I’d say they did so even earlier, whenever Aero in Chrome stopped working on Vista and it was given the old, ugly blue theme again, late 2014 I believe. Last version for xp and vista was version 49, released 2016-03-02. Worst overbloated system resources eater ever. Not for me, sorry, I will stay with W10 Defender. Under latest Windows 10 1809 and latest Chrome x64 beta, I use Windows Defender, Windows Defender Browser Protection extension ver 1.65, and Quad9 DNS. I use Linux Mint with Win 7 in a Virtual Box. The VB uses Bitdefender and Linux doesn’t use any anti-virus monitoring but I do use ClamAV. Perhaps I’m naive, but I haven’t had any problems for many years. Should the Win 7 VB get a severe virus or ransom ware I’ll just wipe the VB and reinstall from a clean backup. After the CCleaner fiasco by Avast I’d never use any of their products. Which security products do you run on your systems? No security products as such here, nevertheless a relatively good security environment, I presume. I don’t go in town on board of a tank, even at 3 in the morning in hot areas, but I remain aware. Same on the Web. Should I opt for a body-guard it certainly wouldn’t be for Avast. Out of interest, Tom, what ‘body-guard’ would you be picking if you really had to? @ShintoPlasm, maybe a Kaspersky agent because many years ago it was the case, satisfactory. But as we all know things change quickly, I’d have to initiate an extensive comparison of security products as of today. I’d be cautious, I have in mind some products which appeared to be themselves problematic, ironical if it is. Generally speaking the cost of a security product in terms of its authority on the OSs Kernel for the sake of its authority on my OSs security is to be considered. The price itself IMO is correlative of a good security product : I believe in freeware but when it comes to security products I wouldn’t want the price in money to be replaced by a price in privacy and/or bad security. @ Tom Hawack – But you STILL haven’t downgraded to Win 10! So how can you possibly say that you’ve got a “relatively safe security environment”? @Valrobex, maybe not downgrading to Win10 participates to my conception of a relatively safe security environment; at least it does in terms of privacy and I often read that both are tied. I doubt I ever adopt Windows 10. When Win7 will be totally outdated (applications, software, browsers requiring then a more recent OS) or when my Home PC breaks down, if Win10 hasn’t by then emerged from its alpha unofficial but true status it is absolutely sure I won’t switch to it; otherwise, it is a possibility (hardly more plausible than snow in Tahiti). Windows Defender for Windows 10 is enough for me. With Windows XP, I used ClamAV. Each time I visit ghacks.net, I click on each advertising, it’s important for me. What private data from your PC does this program send back to its servers? What control over this do we have? So, what are the alternatives for XP then? Before someone gets smart – i’ve built an “old” system (Q9550, 8GB, GTX650) just for games that don’t play well on my main W10 computer. Avast for also got a nice bug since 18.7 where it transforms one’s hard drive to a ticking clock; it reads something once per second…all you hear is tick, tick, tick. Easy solution would be getting a SSD, but i can’t be bothered to throw money into a computer i won’t use after new year (end of Steam’s XP support). I wonder if this will stop the annoying Avast bloatware pop-ups from appearing? “So, what are the alternatives for XP then?” Don’t worry. As long as the virus definition updates are there there’s no need to worry or do anything if you are an XP or Vista user. You will be protected. When the virus definition updates stop, then it is time to think about changing to another anti-virus set-up that continues to update virus definitions, or upgrading your operating system, as adequate protection against new threats will not be there.